Improving the well-being of young children is one of the most important investments a community can make. Infancy and toddlerhood are periods of rapid physical, cognitive, social, and emotional development. During these years, children need nurturing care and appropriate stimulation from their family and friends, as well as community-, state-, and national-level programs and services to ensure positive present and future outcomes. Conversely, we know that negative early experiences (such as poverty), insufficient nurturing and stimulation, poor access to health care, and a lack of other important family supports can have lasting harmful impacts. Philadelphia has taken bold steps that acknowledge the importance of children’s earliest years to ensure a positive future for the city. New initiatives, led by both municipal government and the private, nonprofit sector, are elevating Philadelphia’s profile as a leader in lifting young children to the top of the civic agenda. Through these initiatives, leaders are working to foster cross sector collaboration to improve the long-term outcomes for young children. At the same time, the city and its residents continue to face stiff challenges. This is a time of transition for Philadelphia in many respects, as the city is experiencing changes in demographics, economic growth, housing patterns, and access to education. Philadelphia is simultaneously becoming a richer and poorer city. While poverty and deep poverty continue unabated, Philadelphia is experiencing residential growth (The Pew Charitable Trusts, 2017). The sixth-largest city in the United States, Philadelphia is a diverse, multi-racial, multi-ethnic city, and a reflection of the nation’s current demographic transformation. By 2044, the majority of the U.S. population will be people of color (Colby & Ortman, 2014). Philadelphia is home to about 66,000 children under age three (i.e., infants and toddlers), and already, most among these youngest children (69.8 percent as of 2016) are children of color. While the city has in place numerous programs and services to support its youngest residents, disparities in well being that follow geographic, racial, and ethnic lines are still evident—a reflection of a long legacy of discrimination and disenfranchisement. Despite many bright spots of hope, extremes of poverty and wealth continue to cast a shadow on the city’s future—including that of its youngest residents. This report from Child Trends provides a portrait of the well-being of Philadelphia’s youngest children. It includes a range of indicators (objective measures) intended to highlight how this group is faring, and how its well-being compares with national data. While indicators cannot tell us the underlying reasons why the data appear as they do, they can help identify disparities in well-being, or in the availability or receipt of services. Indicators in this report focus on child- and family-level risk factors for early development, such as poverty, health and safety, and family and community characteristics. The report also highlights the reach of public support systems, including early care and education programs, that can mitigate developmental risks, and promote positive development and resilience. 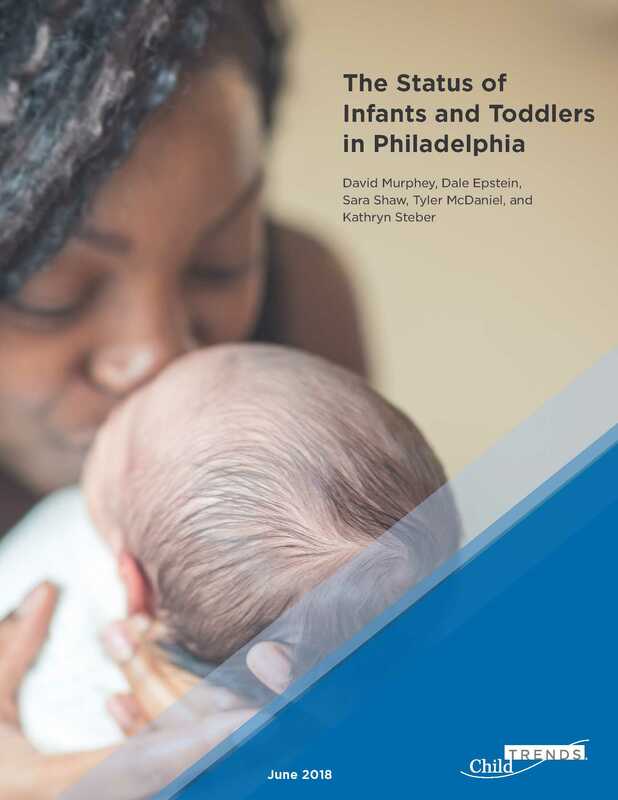 While this report draws upon publicly available data (e.g., from national surveys) and administrative data provided by the city of Philadelphia and state of Pennsylvania, it does not include all relevant indicators of infant/toddler well-being. Some desired indicators data are missing here, either because they are not routinely collected or were not available for this report. Examples include data on routine/preventive medical care, as well as community-level assets and the strengths of families and young children themselves—like secure parent-child attachment—which we know can promote positive development and mitigate some of the risks noted in the report (Ranson & Urichuk, 2008). Further, there is a need for more data that can be reported at sub-city geographic levels. While some data are available at the level of zip codes, most indicators can be reported only on a citywide basis. This lack of capacity limits our understanding of neighborhood-level variability, both in terms of outcomes and in the effectiveness of interventions. Despite these limitations, the data we can include here highlight areas where Philadelphia’s infants and toddlers are faring better, worse, or about the same as their peers nationally, and compared to some other cities with similar demographic characteristics, including size and poverty rates. Perhaps most importantly, the report provides baseline data that can serve as a reference point by which to assess the effectiveness of efforts—both those already underway and those yet to be undertaken—to improve prospects for all the city’s infants and toddlers. Reinvestment Fund’s latest childcare analysis tracks the change over time in the supply of, demand for, and shortages in child care.